On Saturday-Sunday, April 13-14, the Peggy Kirk Bell Girls’ Golf Tour will play the 2019 PKBGT Mid-Atlantic Girls Championship at Bulle Rock Golf Course in Harve de Grace, MD. On June 12, 2005, the LPGA Tour’s preeminent players graced the premises at Bulle Rock Golf Course for the final round of the McDonalds LPGA Championship. It was the first year the event took place in Harve de Grace. When the final pairing made their way toward the 18th green, it was all but certain who would walk away with a major championship to their name. Annika Sorenstam, one of the most recognized and accomplished players in the history of Women’s Golf, added a third LPGA Championship to her trophy case in as many years. The win closed out a historic run at the tail-end of Sorenstam’s career and was the penultimate of her 10 major championships, a number that places her in a tie for fourth place on the all-time list. In the subsequent four years, the likes of Si Re Pak, Suzann Pettersen, Yani Tseng and Anna Nordqvist would hoist the major championship’s trophy above their head at Bulle Rock. Fast forward 10 years from Nordqvist’s victory in 2009 to a field of 49 junior girls golfers set to stand in the shoes of those very same LPGA legends. 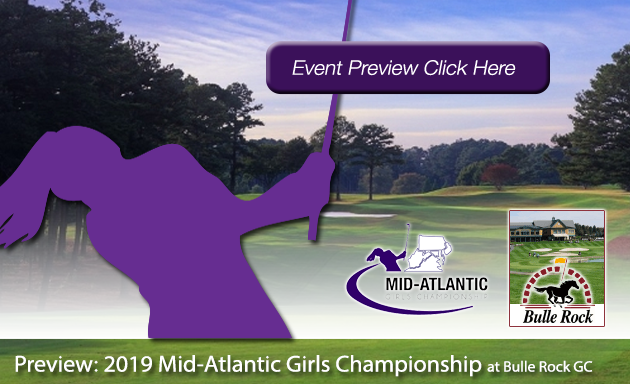 Having patiently yet anxiously awaited the first PKBGT Championship event of 2019 in the Mid-Atlantic, the bright and promising future of girls golf hope to re-create the magic of their idols on a course saturated with LPGA history. The 2019 PKBGT Mid-Atlantic Girls’ Championship marks the return of a championship event to Harve de Grace. Players will compete in two of the tour’s National divisions: Bell National at 5, 750 yards and Futures National at 5,320 yards. Though many PKBGT members have traveled south to compete in National events outside of the region, the Mid-Atlantic Girls Championship presents an opportunity to chase a PKBGT glass bowl close to home. The event, in partnership with the MAPGA and MSGA (Women’s Division), will be the first of 2019 for several members, particularly those north of Virginia. A talented field of girls looking to make a splash on the tour and pick up a win along the way, we delve deeper into the players to watch at Bulle Rock Golf Course next weekend. Highlighting the field of 31 players in the Bell National division, Paris Fieldings (Suffolk, VA 2023) looks to add to her lucrative 2019 resume. Fieldings is the highest ranked player on the PKBGT Performance Index in the field, currently sitting at 18. She is also ranked fourth in the Bell National Order of Merit Rankings and has three Top Five finishes this season, including fourth place at the 2019 PKBGT Spring Invitational. Making her much-anticipated return to the PKBGT, Tatum Walsh (Midlothian, VA 2021) will play in her first event since the PKBGT Invitational in November. Walsh accumulated a handful of wins on the Mid-Atlantic Regional Series last season, including a run of three straight in the middle of the season. She is currently ranked 25 on the Performance Index and looks to join the party atop the Order of Merit rankings with a strong performance in Harve de Grace. Sydney Yermish (Pinehurst, NC 2023) tries to build off of her success in winning the Tar Heel Classic last month. Yermish stood tall, outlasting her opponent in a nail-biting tiebreaker playoff finish. She is now ranked 27 on the Performance Index and 24 of the Order of Merit. Currently ranked seventh on the Order of Merit, Vynie Chen (Centreville, VA 2020) returns to the course. Her top finish of the season came via an eighth-place performance at the PKB Foundation Classic at CCNC. Chen is ranked in the Top 50 of the Performance Index. Rounding out the players to watch in the Bell National field is Elizabeth Coffren (Owings, MD 2020). Coffren’s top performance this season came in the form of a T9 finish at the PKB Junior, but she looks to return to the top of the leaderboard as she did at last year’s Maryland Classic where she won the event. She is currently ranked in the Top 50 of the Performance Index and 29 on the Order of Merit. Leading the 18 player Futures National field, Taylor Park (Fairfax, VA 2022) enters the tournament as the highest ranked player on the Futures National Order of Merit. Sitting at 7, Park has two Top 10 finishes on the season and looks to add to that number at Bulle Rock GC. Fresh off of her best performance of the 2019 season, a T3 finish at the Commonwealth Classic, Amelia Cho (Ashburn, VA 2024) hopes to ride the wave of success to another top finish in Maryland. She is currently ranked 16 on the Order of Merit and has an eighth-place finish at the PKB Foundation Classic to go along with last weekend’s performance. After falling short in a playoff tiebreaker at the Tar Heel Classic, Josephine Nguyen (Springfield, VA 2024) attempts to jump the hurdle and bring home her first win of the season. She finished the Tar Heel Classic T2 and frequented the Top Three at Mid-Atlantic Regional Series events last season. Nguyen is currently ranked 29 on the Order of Merit. Closing out the players to watch at the 2019 Mid-Atlantic Girls Championship is Cailyn Park (Fairfax, VA 2025). Hoping to challenge her sister’s success, Park is in search of her first Top 10 finish since moving into the Futures National division. She was a regular in the Top Three of the Discovery division at Mid-Atlantic Regional Series events last season and finished alone atop the leaderboard in one event. She is currently ranked in the Top 50 of the Order of Merit rankings. We would like to wish all of our competitors the best of luck at the 2019 PKBGT Mid-Atlantic Girls Championship at Bulle Rock Golf Course! To all who attend, don’t forget to take in the majestic and historic beauty of the facilities. A special thanks to our event partners, the MAPGA and the MSGA (Women’s Division). We look forward to an enjoyable and exciting event!